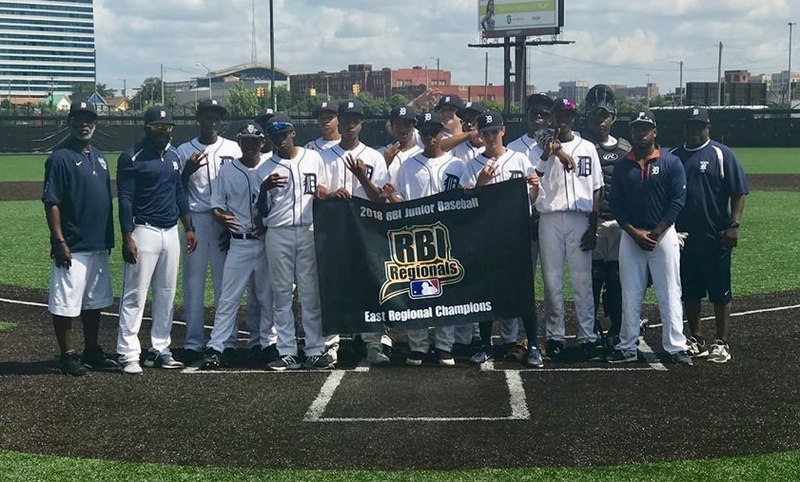 The Detroit PAL RBI Junior team advanced to the RBI World Series for the third consecutive year. On August 6-10, the RBI World Series took place in Minneapolis, Minnesota. RBI stands for Reviving Baseball in the Inner City and it is a youth baseball initiative sponsored by Major League Baseball. A group of 14 young men age 15 and under had the opportunity to represent Detroit at the World Series. The team was coached by Mark Brown, Mark Brown Jr., Ken Williams and Mike Harris. There were a total of eight teams at the World Series representing eight regions from across the United States, with one team from an international region (Uganda). Representing the Junior Division of the RBI World Series along with Detroit was Uganda RBI, Chicago White Sox RBI, Philadelphia Phillies RBI, Jackie Robinson RBI, Rays RBI (Tampa), Houston Astros RBI and Arizona RBI. To qualify for the World Series, each team had to participate in a regional tournament. The Detroit Junior team competed in the regional which was held in Detroit at The Corner Ballpark presented by Adient. Including Detroit, there were four other teams from different states that competed. Those teams were Cincinnati RBI, Pittsburgh RBI, Indianapolis RBI and Cleveland RBI. Detroit RBI went undefeated in the regional with a 5-0 record, defeating Cincinnati RBI in the championship game. The junior team finished the World Series with a record of 1-2 in pool play. They lost the first two games, 12-6 to Chicago White Sox and 9-4 to Rays RBI Tampa (Junior Division Champions). The juniors were able to defeat Jackie Robinson with a score of 13-6 in the final game of pool play. In the quarter finals, the junior team squared off against Arizona RBI and lost a close one 3-2 in the final inning. Though the junior team fell short, they had an amazing run this year! Making the RBI World Series for three consecutive years is not an easy task. This talented group of young men features players from all around the city of Detroit. Detroit PAL would like to congratulate our junior boys’ team on an exceptional season and making it back to the World Series.